A blog about play-based learning and an approach to teaching mathematics that I call the Number Agents. This approach uses Mantle of the Expert to create an imagined company. It is the most successful way I have found to teach maths! You can find me on facebook by searching Number Agents. What I love about Number Agents! Last year my primary inquiry was around provocations, I wanted to work on the way I used these in my class to deepen the play and discovery. What I discovered quite quickly is that first I actually needed to understand what a provocation is. My understanding going into 2018 was that an invitation was specific, it invited children to play/discover in a specific way. A provocation was open ended, it allowed children to interact with a set provocation however their fancy took them. After trying to set a few provocations, I quickly discovered that perhaps my definition was flawed and the way I was attempting to provoke simply wasn't going to work in the way I wanted to. What I discovered is encapsulated in the statement below. Once you have taken the time to observe and reflect, it’s time to act on your thinking. After observation and reflection, you will be deciding whether you want to plan a response or if you need to find out more. One way to make that decision is to provide a provocation or a set of invitations for the children and then watch for the response (Stacey, Emergent Curriculum, 2009). Although my provocations were well intended I wasn't actually tuning into the play to create them. I wasn't using them as a process of noticing, reflecting, recognising and responding, I was just setting what I thought were lovely provocations, but they held little interest for the children because that wasn't where their play was taking them. I was seeing fabulous things online and thinking I could recreate these in my classroom, the truth is, if it hadn't come from the children, it wasn't actually worth doing, no matter how interesting I thought it was the children simply were not interested. Quite logically this discovery around provocations led me to further develop my understandings around planning, which I had been struggling with a little. Backward planning was born. Before I go further I want to attempt to offer my definition of invitation and provocation as I find the are often offered up as the same thing and used interchangeably. From various readings I like the idea that the environment we provide is an invitation. An invitation into play. For me an invitation is not based on anything I have noticed in the play and am therefore responding to, an invitation is based on what I know about the children, the age group, the way they like to play and designed to invite further play. To encourage curiosity, discovery, wonderings, various types of play, that may then reveal (or not) further interests and urges that I may be able to provoke further. The teacher may then choose to use the play and interests they see as a result to provoke further. This might be a simple "what if" could even be as basic as simple action or movement, a change in body language, an inclination, or as deliberate as a conversation. 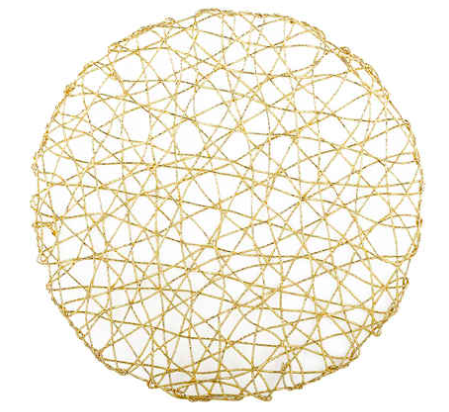 When I think of invitations I think of intention. There is an intention by providing the invitation to inspire/encourage play in a certain way. 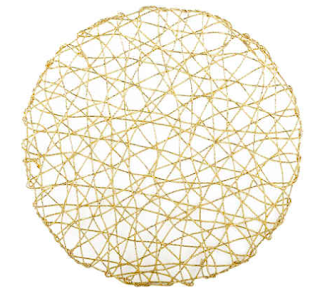 I often use these specifically for writing, with the best example being our Spider Sabrina, who started out as just a web on the wall (pictured below), it was the children themselves that decided it was a web...if they had not done this, it would have evolved into something else this 'web' did eventually include a spider that would send us messages. The messages were my intention, but it was the children that allowed me to do this by sharing their knowledge of the book Charlotte's Web. My intention here was to encourage talk, to provide a bit of magic that may or may not evoke a response from the children. The great interest in Sabrina, led me to do some provocation around spiders, which then evolved into insects and other living creatures. Had the children not at all been interested in the spider, I would have left it at that. I really like this article around provocations and invitations. The point I have got to with understanding invitations and provocations is to think of invitations as a way to spark play. As a teacher we then notice the interests being sparked from this invitation and provoke further, perhaps by providing several different invitations around this same interest. For me an invitation would only evolve further to guide further provocation if the children show interest or reveal to me certain understandings or questions. 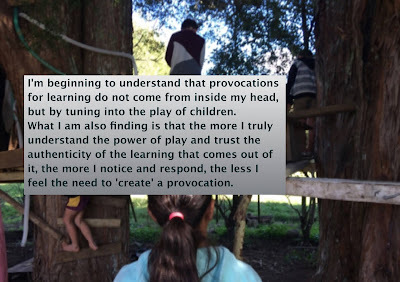 I will continue to provide provocations through photo, video, discussion, simple questioning, play, specific invitations until that interest dries up...we will then move on. This may be the length of a day, a week, or even over a month. Sometimes the interest may be fleeting and come to an end within an hour. Within any classroom there may of course be several different provocations going on at once and this is the balancing act of the teacher. When to provoke further, and when to just leave them to it. I like one teachers definition, taking straight from the article. “an invitation is the spark, a provocation fans the fire”. These quotes that resonate with me. The materials we choose to bring into our classrooms reveal the choices we have made about knowledge and what we think is important to know. How children are invited to use the materials indicates the role they shall have in their learning. Materials are the text of early childhood classrooms. Unlike books filled with facts and printed with words, materials are more like outlines. They offer openings and pathways by and through which children may enter the world of knowledge. Materials become the tools with which children give form to and express their understanding of the world and the meanings they have constructed” (Cuffaro, Experimenting with the World, 1995). Teachers endeavour to continually provoke children’s natural propensities to search for meanings, to pose questions of themselves and others, and to interpret the phenomena of their own lives. (Cooper, The Hundred Languages of Children, 2012). So plain and simply a provocation comes from the children, it is part of the cycle of noticing, reflecting, recognising and responding. It will morph and change as guided by the children and within any classroom there is clearly an agreement between the adults and children that this is something we want to discover and learn more about. From that understanding, backward planning was born. This year I had the courage to completely ditch any forward planning, other than my ingredients of play (you will need to click on the photo to enlarge.) That includes any timetable. Guided by the week before and my plan below I would set priorities for the week, but when and how these happened were fluid. 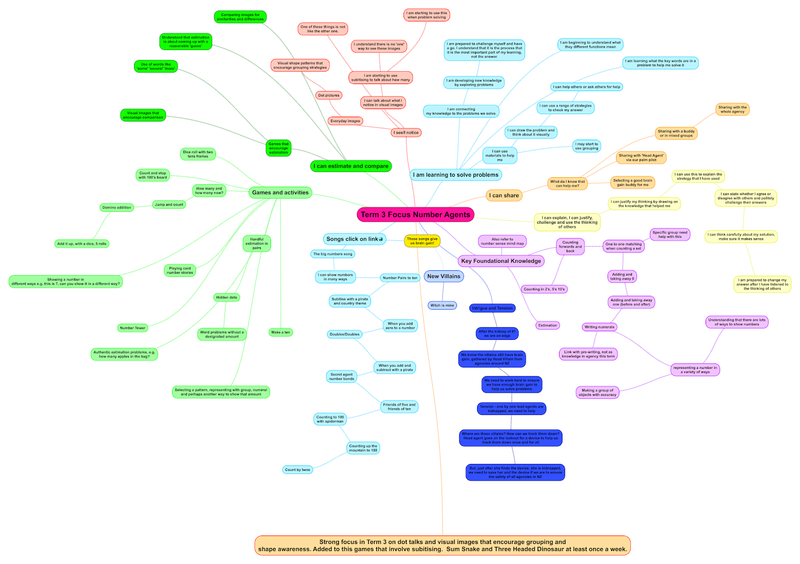 I would then, in my teaching/learning scrapbook keep a mind map of where the learning actually went. Tuning into interests, recognising the learning, noting these down and responding as was appropriate. Writing down what we had done, after we had done it. Usually the mind map is in handwritten scrawl, but this one below is neat and tidy so you can see what I mean. To go along with this, we keep a class scrapbook where we document our learning in photos, captions, drawings etc. This is a document I refer back to constantly throughout the day. We also share our learning on seesaw, so there is loads of documentation of the learning. What I really want to try in 2019 is creating a mind map for each child. Having their name or photo in the middle and then documenting their interests, urges, social emotional learning and other areas of learning around the outside. I think this will create a very real and valid picture of the child as an individual and be a great discussion starter with whānau. So as I end this blog post, I still feel a little vague on invitations vs provocations, but have come to terms that it doesn't really matter. Invitations are the environment we provide, what we choose to put in this environment and provocations are what we do based on the interests and urges we see through children playing in that environment. What I am clear on is this...nothing I do in the environment should ever say that there is one way to play with or interact with this invitation, it is not my job to tell, it is my job to notice, reflect, recognise and respond. To allow learning to be a mutual agreement between the children as peers and with myself, to truly allow it to be a mutually beneficial journey with no prescribed destination but lovely gorgeous places to explore along the way. I hope everyone is enjoying their well deserved holidays! Reading in a classroom based on play has been one of my professional inquiries over the past few years. This year, we have made a few tweaks here and there, but what has most dramatically changed, is my understanding of how the brain learns to read. The seven minute video below is a good summary of what I have been working on this year, the understanding that the brain has to rewire itself for reading is crucial I believe for all teachers. Key also is the fact that spoken language is integral to later success and that in reading the brain is always translating one letter at a time, even though it gets better and better at this with practice. Basically the brain is linking the visual, to the sound and initially this is a slow and very deliberate process. 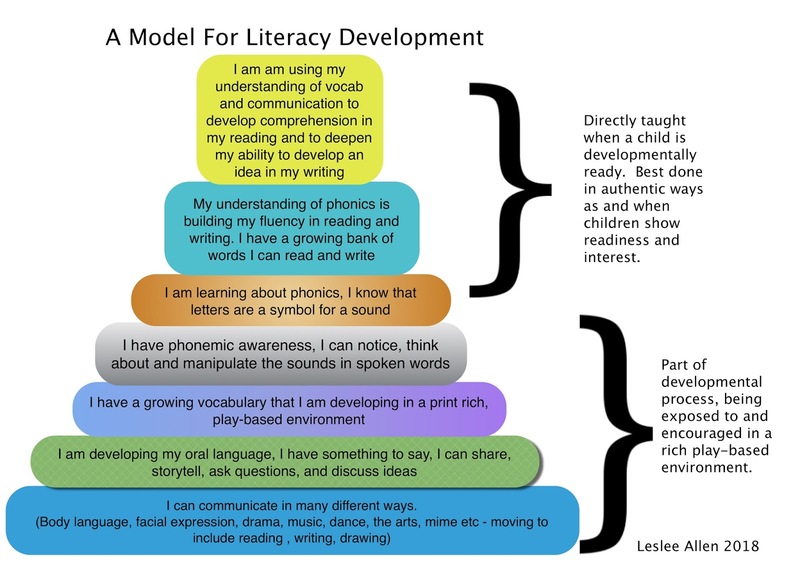 Adding on here to what I know about brain development, it is a process that happens effectively and efficiently if we wait to engage with reading until a child is developmentally ready. 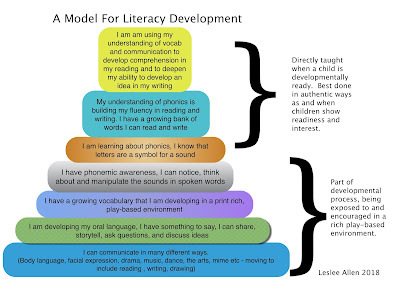 From my new understandings I developed this framework for literacy development in my class. This diagram shows clearly how I guide the acquisition of reading skills long before we ever engage in formally 'teaching' children to read. We have had enormous success with helping children to develop a readiness for reading this year, but it is really important to note that to do this, we must put our old teaching brain to the side as some of our children, even after a year at school are not yet formally reading with us, and that is absolutely appropriate for that child. Hugely important to note here is that when children do start formally reading with us, they understand what they are doing, are interested and because of the strong emphasis on phonetic awareness, have the skills to be able to solve unknown words. Given time and patience, they don't really need us at all. We are free to help them develop strategies that will assist this process. What has most changed is the way I interact with the reader, engaging with readers that are ready has allowed me to develop my own awareness of just how much of the work I was doing before. When I cast my mind back to those emergent-red-yellow groups where I used to have my voice 'just' in front of children, like I was trained to do way back when....pausing to teach strategies etc, I realise that many children were little more than parroting me....later on, further up the school, they were more inclined to sit back and let someone else in the group solve the word for them. Their brain wasn't doing what it needed to do to wire itself to read successfully. I now let the child read, I wait, as long as it takes for them to solve the word, prompting with the stretching of sounds if really needed and re-reading the text just in case the sense has been lost. We share the reading, in this process a few pages is hard work for the brain, I am quite happy to share the reading process. What has worked well this year? 1) Decodable texts. These were a breakthrough for us. We have been using books from Liz Kane Literacy. They have been excellent at building strong foundations and developing independence in using the code. They have also helped to build our own understandings of the teaching of phonics.https://lizkaneliteracy.co.nz/ This led me to think about our older children with code issues and I found these books. https://global.oup.com/education/content/primary/series/projectx/project-x-code/?region=international These have been breakthrough for us, children love them and wow they are just wonderful! Engaging, intriguing, perfect! We have now purchased a superhero series and an alien series in the project x range. All decodable. We have gone through https://www.edify.co.nz/ to import these and they have been super helpful, I really recommend them! 2) Individual reading as an when children are ready. We read one on one, twice a week with children, this has proved to be more than enough. 3) Shared reading of big books and chapter books. Our current chapter book is Amelia Jane, comprehension has come along in leaps and bounds since I started routinely reading a chapter each day to them. They can paint the picture in their head, comprehend what is happening and predict what will happen. They laugh at the story and the characters very much come alive for them. 4) Interest books, each day children spend time browsing books that interest them, there is no burden on them to be able to read it, but they get a huge amount of pleasure from sharing with their friends...oral language off the hook! 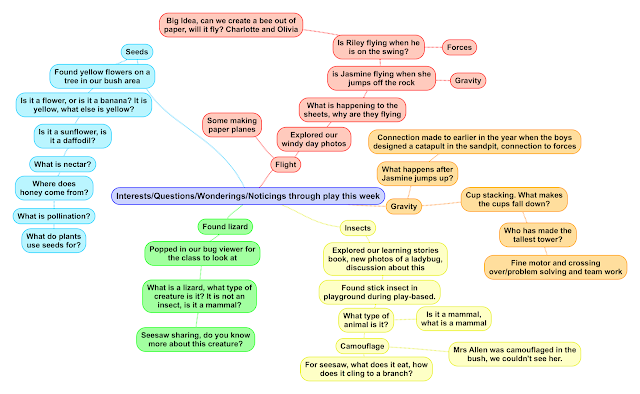 5)Rich discussion in a play based class has made such a wonderful different to vocab and comprehension. Talking about my world, allows me to understand my world. 6) Not taking things for granted. Occasionally in books children will encounter words that we think they should understand, but they actually don't. Simply asking them 'do you know what that means...' allows us to feed in just in time vocab. 7)Telling - children work so hard to learn to read and write when they are ready and interested, if they ask me how to write something, or what a word says, I tell them. I know that with the mindsets we are establishing, they will have tried hard to work it out before they come and ask me. 8) Developmental goals- the have continued to be very effective for us this year. This blog is a reflection of my thoughts. It is not in published form and is based on my opinion and discoveries. Blog posts may contain spelling and grammar errors as they have not been formally edited. Basically this blog is my thoughts in written form :) I hope the posts are of some use to you. Teaching mathematics and play-based learning along with Mantle of the Expert are among my teaching passions. I am also against National Standards and any sort of education system that supports a testing culture, that will probably come through quite clearly in my posts. :) Have a super day! Hard copy of book $26.50 for book and postage within NZ . I will post out of NZ, please contact me so I can sort postage cost. Alternatively you can purchase a PDF copy of the book from teachers pay teachers. This blog has been created as another resource for those interested in this teaching approach. It is based on my short book 'Number Agents' and reflects my day to day learning about this process. I have been teaching for 20 years now and have a passion for learning through play and drama. The Mantle of the Expert approach transformed my teaching and continues to do so. Number agents has its roots in Mantle of the Expert, but has now become a teaching approach in its own right! I have been a teaching principal for the last ten years and live in Northland New Zealand with my husband and two teenage children. The book is $20 plus $6.50 for postage within NZ.